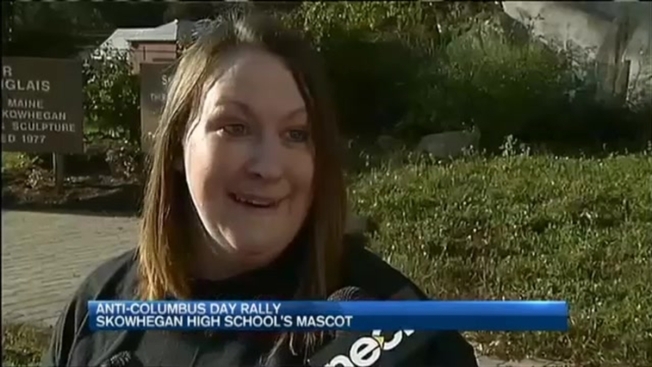 Columbus Day was a controversial day in Skowhegan, Maine, where the Indian is the school mascot. Native Americans have been asking the school to remove it, saying the mascot is offensive. The group Skowhegan Indian Pride has been fighting to keep the Indian mascot, and chose Columbus Day for a rally. "We love the Indians," said Irene Gibson, attending the Skowhegan Pride rally. "We love being called the Indians." Months ago, the Skowhegan school board narrowly decided to keep the Indian as the school mascot, despite pleas to change it. Native American community members say the mascot is offensive, and holding a rally on Columbus Day is also disrespectful. "At best it's inappropriate, and it's insulting," said Maulin Smith, a member of the Penobscot Nation. Smith, and about 40 other people, attended an Indigenous People's Day rally at nearby Lake George Park. Participants called for Columbus Day to be abolished, and want to use the day to celebrate Native American culture. "Anytime someone thinks we need to honor someone with a history of genocide, I think action needs to be taken," said Barry Dana, former Chief of the Penobscot Nation. Dana said their Indigenous People's Day rally is not a response to the Skowhegan Indian Pride rally, and is an annual event on Columbus Day. The Skowhegan Indian Pride rally was also a fundraiser, where people donated items to the local food pantry and animal shelter.